Oh December...you were such a great month. How did I not blog about you? I think there is a part of me that is convinced that I will remember things for forever. I think this despite the fact that I've been firmly entrenched in the "which kid was it that did cute thing A or crazy thing B?" for years now. While there is a certain beauty and peace about living in denial, there are some things that I want to remember to do for next year - so here they are. When it comes to Christmas, we've got family gatherings in spades. It's the beauty of living so close to so much of our family. However - what do you do when most of "your generation" of family can't be together because of scheduling conflicts for Christmas events...schedule something different of course! We had almost all of the cousins on the Bateman side of the fam make it out to an early Christmas party at our place, and it was so much fun! We got to eat together (I can't have fun unless there is food involved, it's something I'm working on, so don't judge me ok? ), visit and laugh together, and those of us that have kids were delighted for a chance for the next generation of cousins to get to know one another better. I didn't get a picture of everyone who was there - I'll work on that for next year. The collage above makes me think of my Grampa Bateman, who upon reflecting on all of his grand and great-grandkids, has been heard to say with delight.."not an ugly one in the whole bunch!" Did I mention I love my family? There were a lot of unexpected events that happened this fall and winter. Ones that make you hug your loved ones a little tighter, pray a little more, and realize that all the plans that seem so important when you make them, fade into nothing when a family crisis hits. The key one being my youngest sister ending up in the hospital for 12 days mid-December. Things are a little more stable now. We were never really worried for her life...ok, we were, but we were told we shouldn't be. It certainly felt like a Christmas miracle when Kyla was discharged on Dec 23rd. She is expecting baby number two, and we are so thankful for each prayer that was prayed and we continue to covet each prayer. They still don't know why she's having the heart trouble she is, but so far the baby is fine and we are just praying she gets better soon -22 weeks seems like a very long ways to goht now. I am always so thankful my family functions like it does when crisis hits. We all know how to pull together and help out one another. We'd rather avoid crisis altogether, but it's not nearly as scary going through things when you know your whole family has got your back. Someone will encourage, another will clean, another will babysit, and another will hold your hand while you wait...I love my family. Talk amongst yourselves, I'm feeling verklempt. I thought it wouldn't happen this year - but on Christmas Eve day we did it. 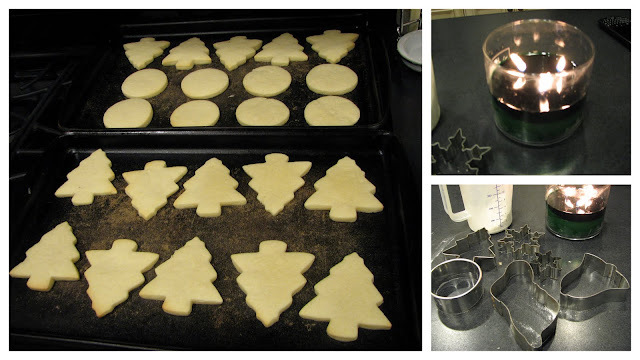 We lit candles that make the house smell like a pine forest, turned up the Christmas music and we baked up a storm. I was so thankful for that day, it truly was a gift. With all of the other unexpected events that happened preceding Christmas, it was beginning to look a lot like the Christmas baking that we so enjoy doing and eating, wasn't going to happen, but it did! On a totally unrelated note, I am officially on hour 9 of South Beach/17 day/Low-Carb diet. It's totally unrelated to this though. Truckloads of Salted Caramel Shortbread, Sugar Cookies, Chocolate Mint Brownies, Melting Moments, Root Beer Cookies, Meat Pasties and Schnetze (farmer sausage rolls) have nothing to do with it. I'm pretty sure that the only vegetables I ate in December were tree-shaped sugar cookie covered in green icing. Christmas Giving starts with C and then a G, sort of. For the month of December we had our oldest three kids earn money through doing extra chores around the house. That way they would be "earning" the money they needed to buy a Christmas gift for the sibling whose name they drew. We also decided to split the money they made 50/50 with the person whose name they drew and then the other half would go to a gift for a child in a developing country. (We chose the World Vision Gift Catalogue) It was great to see the kids working hard to give good gifts to their siblings and to make a difference in a child's life around the world. Despite our utter exhaustion, and despite the fact that everything seems far too chaotic, the kids had their annual sleepover in our room...it's a lot of mattresses in case you wondered! Somehow we managed to get their stocking supplies out of our bedroom without their noticing and we got everything ready early in the morning and summoned them with the traditional "ho-ho-ho, MEERRRRRYYY Christmas!" I am admittedly not the best picture taker. I usually have one or two pictures of Christmas morning, and that's it. I blame getting so wrapped up in the events going on that I don't take time to stop and capture more than a couple of moments with me camera. Mental note for next year - make sure to get a picture of myself in the Christmas morning montage! Josh is an excellent gift giver. He has learned the way to make Christmas great, is to make me cry. You don't feel this way? I tell you, you are missing out. I had shown him a necklace that I liked - but it required ordering well in advance to make it here before Christmas. He did it, which surprised me (it shouldn't have). "The kids" gave me this beautiful family tree necklace. I felt loved. I felt unworthy of the fantastic family I have. I felt loved some more. I cried. I almost made some of my kids cry, so I pulled myself together. Everytime I wear the necklace, I still feel the same. Maybe it will help keep Attila-the-Mom at bay, when I remember how blessed I am to be a mother of five. Then the man who knows me better than anyone else gave me an ice cream maker. There was much rejoicing. It is so. much. fun. I may make myself cry some more, for totally different reasons, if I don't stop eating ice cream with such wild abandon. But the possibilities! The fun! The fat! I was made for this ice cream maker. Thank you Honey, for always giving such good gifts. A New Year, A New Post for Family Matters!